When a strong vortical wake impacts a structure ,the pressure on the impacted surface sees large variations in its amplitude. This pressure fluctuation is one of the main sources causing severe structural vibration and hydrodynamic noise. Economical and effective prediction methods of the fluctuating pressure are required by engineers in many fields. 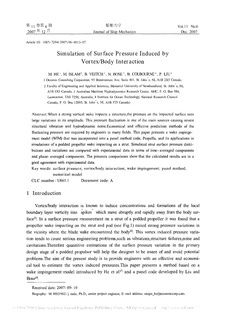 This paper presents a wake impingement model (WIM) that was incorporated into a panel method code, Propella, and its applications in simulations of a podded propeller wake impacting on a strut. Simulated strut surface pressure distributions and variations are compared with experimental data in term of time- averaged components and phase- averaged components. The pressure comparisons show that the calculated results are in a good agreement with experimental data.